Let's prevent unnecessary mosquito spraying in Chester County! Also see and like us in Facebook at dontsprayme. Download the bill and see the latest info here. Contact Chester County rep Chrissy Houlahan to ask her to support the bill here. Although the EPA banned most residential uses of organophosphates like chlorpyrifos in 2001, it has so far been turned back in banning chlorpyrifos in agriculture and mosquito control. Although Chester County has not been spraying chloripyrifos to try to kill adult mosquitoes, nothing currently prevents it from doing so. More background here. Also search chlorpyrifos on our site for posts like here. WASHINGTON, D.C. – Testing released today found store and name brand foods produced and sold by the top four U.S. food retailers, Kroger (NYSE:KR), Walmart (NYSE: WMT), Costco (NYSE:COST) and Albertsons — purchased in 15 cities across the country contain residues of toxic pesticides linked to a range of serious health and environmental problems. Glyphosate, a probable human carcinogen according to the World Health Organization’s cancer research agency, was found on 100% of oat cereal samples and 100% of pinto bean samples tested. Organophosphates, which are so toxic to children’s developing brains that scientists have called for a complete ban, were found in 100% of applesauce samples, 61% of whole apples and 25% of spinach samples, at levels ranging from 0 to 3.31 nmol/g. Neonicotinoids, which the European Union has banned due to robust science linking the chemicals to bee die-offs and which have been linked to endocrine disruption and autism spectrum disorder, were found in 80% of spinach and 73% of applesauce samples ranging from 0 to 0.14 nmol/g…. Don’t Spray Me! worked hard in 2018, with many events to increase awareness of non-toxic mosquito control methods and overuse of harmful chemicals, plus a very successful fundraiser auction (thanks to all who joined us there on December 1!). We also have a lot of changes to share with you for 2019. Please see our 2018 report below; or you can download this pdf: Annual Report 2018 DSM final. • In 2018, we held 9 public events either alone or collaboratively and conducted a successful summer Youth Corps program with the help of a WCU graduate student intern. • In 2019, we plan to move from the Block Captain system of distributing info to a new system with 5 leaders in each of the Borough’s 7 wards, in conjunction with the newly formed West Chester Green Team. Please volunteer to help in this important new venture! We will need about 35 Borough residents in all. • We will also keep reaching out to other municipalities, including Downingtown, which like some parts of West Chester was sprayed last. year and has low-lying flat areas, some of which are subject to flooding. • We look forward in 2019 to West Chester Borough taking over its own larviciding to cut down on mosquito breeding. We are grateful to the Borough officials who have made that possible. 2. 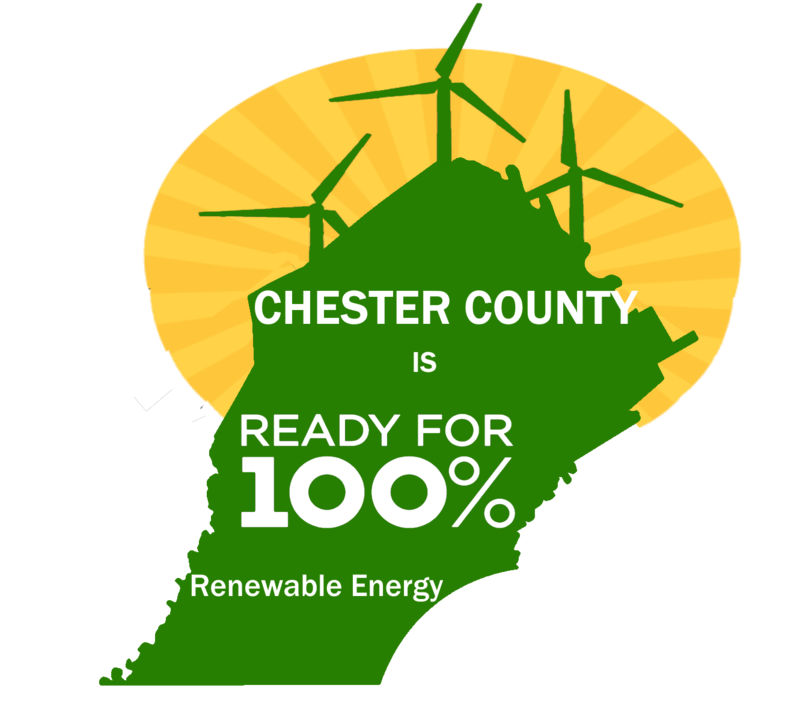 Chester County Environment Alliance; for more see CCEA’s web site and public Facebook page. 2018 was a year of transitions. Don’t Spray Me! was founded in 2015 in a wave of dissatisfaction with a plan to spray anti-mosquito insecticide in the NE section of the Borough. 2016 and 2017 were years of building a network of Block Captains, distributing a letter from the Mayor and an educational doorhanger from the Borough, and collaborating with the Borough Sustainability Coordinator and County Director of Department of Health through the West Nile Task Force originally set up by then-Mayor Carolyn Comitta in 2012. In 2017 DSM became a Sustainability Committee within Sierra Club’s Southeastern PA Group. What has changed? The West Nile Task Force met only once in 2018, the Sustainability Coordinator position has been vacant since August, and the Department of Health has ceased sharing information publicly about its own activities, so that we have resorted to PA Right To Know procedures to find material that is in the public domain. Also, partly as a result of an unacceptably worded doorhanger and delayed printing of its replacement, Block Captains began to lose their commitment; some said they did not realize this would be such a long-term effort. As a result, we plan to go to a new system in 2019, with several leaders in each of the Borough’s 7 wards taking responsibility for distribution of materials and information. We had expected that in 2018, the Borough and County would be working together to identify and larvicide sites where standing water allowed mosquitoes to breed in quantity. As it turned out, the County conducted only 3 larvicide events in the entire Borough all summer, and did not treat the mosquito hot spots at all during the high mosquito season. It was an increasingly bad mosquito season through July and August, although once again we know of no incidents of mosquito-borne illness in the Borough. In the fall, Borough government agreed to take over larviciding in the Borough from the County, and we look forward to much greater responsiveness to residents’ needs in 2019. We successfully worked with West Chester Borough Council to fend off planned truck-based spraying on August 16 but unfortunately on Sept. 11 the County sprayed half of the planned area in the Borough before abandoning the effort in rainy weather. Mosquitoes seemed little affected, though a few other dead insects were observed. Our science team also took readings of pesticide levels deposited in various settings but unfortunately it has proved difficult to get the results measured in a lab due to labs’ wariness about the chemicals involved. In 2018, our Executive Board met 10 times to provide overall guidance to our effort. Although the Board has had members from other municipalities, those became involved in parallel environmental efforts and the Board evolved to represent only West Chester Borough. East Bradford municipality has continued distributing natural mosquito control information to its residents and West Goshen and East Goshen have been moving toward their own environmental advisory committees, with which we hope to work. In other urban areas, efforts to inspire groups related to Don’t Spray Me! have not yet succeeded; although some residents of Phoenixville and Downingtown were sprayed in 2018 and 2017 respectively, our progress there has not advanced beyond initial discussions, nor in Kennett Square. Our web site and Facebook page continue to serve as a resource for all interested. As part of our publicity campaign, we have a very recognizable “gas mask baby” yard sign and logo dating to 2016 as well as the 2017 “happy baby” model. In 2018, we introduced the in-between statement of the baby holding his gas mask. People choose one to suit their views. Results and visibility are good. • “Saving the Environment: Pennsylvania to Paris,” a discussion with 3 highly qualified speakers on Feb. 25, with about 90 in attendance. • An Earth Day rally, March for the Environment, and displays on April 22, with over 150 attendees. • A talk to about 30 people by our entomological advisor Dr. John Jackson on “Bugs and Weeds Away–the Natural Way” on May 29. • A display at CommUNITY day at the Melton Center on August 19. • A (small) demonstration at the County Court House on August 31. • The Fall Environmental Film Series at West Chester University, with attendance averaging around 75 for four films. • A sizable Chester County March for Climate Justice and Environment as part of a national movement on Sept. 10. • A public meeting about mosquito spraying in West Chester with about 30 people on Sept. 25. 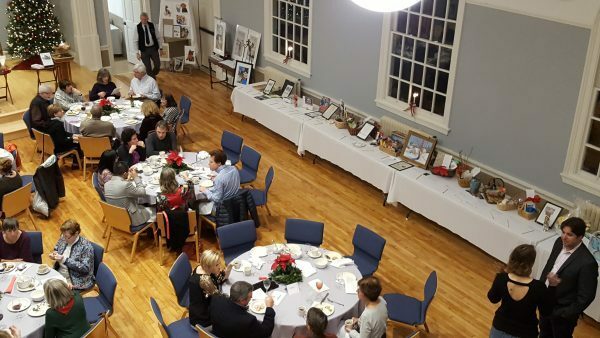 • A very successful fundraiser dinner and auction on Dec. 1 with about 75 attendees. • A particular success was the Sierra Club Youth Corps / Adopt a Drain Field program, directed by Rachel Davis with WCU graduate student and DSM intern Kyle Erisman, whose stipend was covered by a Sierra Club Grassroots Network grant, for which we are grateful, as well as for support for some of our other efforts. On a number of Sunday afternoons spread through the summer, several youths and others assessed the condition of Borough storm drains and removed plastic and organic matter that could have blocked runoff from going through the the grates at street level. Meanwhile, Kyle mapped the drains using GIS technology and shared the results with the Borough’s Public Works department; those data will be invaluable in future years for spotting drain issues and conducting larviciding. Growing out of the collaborative Earth Day event, Don’t Spray Me! 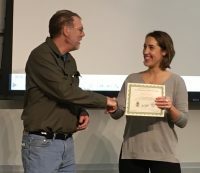 and other groups founded a new Chester County Environment Alliance, a framework for different organizations to collaborate on planning and programming and to amplify others’ activities. The Alliance met on May 19 and two other times in 2018 and intensified its cooperation on large public activities. In addition, in the fall we were instrumental in founding a West Chester Area Green Team, which now groups efforts in renewable energy and climate protection, elimination of unnecessary plastic usage, and avoidance of toxic pesticides and herbicides. Don’t Spray Me! will work within that new entity while remaining within the Sierra Club, except that our Youth Corps will now become part of the Green Team. In sum, DSM achieved good visibility and carried out a number of events and the Youth Corps program. Although distribution of materials and prevention of spraying in the Borough and elsewhere did not go as well as planned, we laid the framework for a whole new relation with the Borough, for municipally-controlled larviciding to avoid pressure to spray, and for collaboration with other environmental groups in the County. Beyond Pesticides letter to our elected representative in Congress. Sign on here. 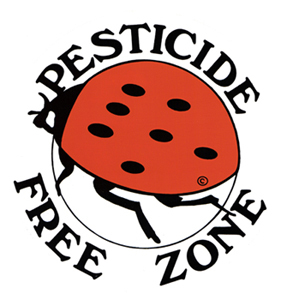 Earlier this month, U.S. Representative Nydia Velásquez (D-NY) introduced The Ban Toxic Pesticides Act, H.R.230 which bans the insecticide chlorpyrifos from commerce. Chlorpyrifos is a toxic chemical that has been linked to damaging and often irreversible health outcomes in workers, pregnant women, and children. As a result of a revised human health risk assessment, the Environmental Protection Agency (EPA) developed a regulation to ban chlorpyrifos in 2016. Under the Trump Administration, the EPA has taken steps to reverse the regulation. >> Ask your U.S. Representative to Co-Sponsor H.R. 230 to Stop the Use of the Toxic Insecticide Chlorpyrifos, which is Damaging Children’s Brains. Chlorypyrifos is a widely used pesticide. Agriculture companies annually spray 6 million pounds of the substance on crops like citrus, apples, and cherries. In the same family as Sarin gas, the substance was initially developed prior to World War II as a chemical weapon. It can overstimulate the nervous system to cause nausea, dizziness, and confusion. With very high exposures (accidents or spills), it can cause respiratory paralysis and even death. When applying the chemical to fields, workers must wear protective garments such as respirators. Workers are then blocked from entering the fields from 24 hours up to 5 days after application due to the chemical exposure risk. In August, the U.S. 9th Circuit Court of Appeals ordered the Environmental Protection Agency (EPA) to implement its previous proposed ban of the chemical in the U.S. However, the Administration is appealing the ruling, seeking to prevent implementation of the Obama-era ban. There is a strong recent history of action of introducing legislation to remove chlorpyrifos from use. The same legislation being proposed by Valazquez was introduced in the last Congress as H.R. 3380, Pesticide Protection Act (2017). In the closing days of the 115th Congress, U.S. Senator Brian Schatz (D-Hawai’i) introduced a bill to ban chlorpyrifos. The Prohibit Chlorpyrifos Poisoning Students Act (S. 3764) would elevate Hawai’i’s state ban to the national level, banning the use of the chemical near (within 300 feet of) schools in 2019 and banning its sale and distribution altogether the following year. The legislation follows a 2017 bill introduced by Senator Tom Udall (D-NM), Protect Children, Farmers and Farmworkers from Nerve Agent Pesticides Act, S. 1624, that deems any food with chlorpyrifos residues to be adulterated and therefore illegal. EPA negotiated a cancellation of all residential uses (with the exception of golf courses and disease-carrying mosquitoes) in 2000 after finding significant neurotoxic effects on children. In June, 2018, Hawai’i became the first state to ban chlorpyrifos, effective 2022. Given the abundant research demonstrating deleterious effects of chlorpyrifos on human health –including a 2016 EPA human risk assessment that found the agency’s exposure threshold is exceeded for children, and citing concerns about chlorpyrifos levels in the air in schools, homes, and communities — it is critical to support a complete ban on the chemical. H.R. 230 has 56 house representative co-sponsors. If your representative has already signed on, you will be prompted to send them a thank you note that encourages them to keep advocating for human and environmental health. >> Ask your U.S. Representative to Co-Sponsor H.R. 230 to Stop the Use of the Toxic Insecticide Chlorpyrifos, which is Damaging Children’s Brains. .
A study at the University of Maine (UMaine) finds that adding blackberry leaf litter in stormwater catch basins creates an “ecological trap,” enticing mosquito females to lay eggs in sites unsuitable for larvae survival. Employing this new and incredibly viable “attract-and-kill’ tool for mosquito control shows potential for preventing the breeding of mosquitoes that may carry insect-borne diseases, especially in urban environments. Stormwater catch basins regularly accumulate leaf litter, which serve as habitat for the mosquito species Culex pipiens (Cx. Pipiens) that may carry West Nile virus. Previous University of Maine research discovered decomposing leaf litter from Amur honeysuckle (Lonicera maackii) and common blackberry (Rubus allegheniensis) produces chemical compounds that attracts and stimulates Cx. Pipiens female to oviposit, or lay eggs. Investigating the attractiveness and lethality of varying catch basin conditions to mosquitoes, researchers hypothesized that blackberry leaf litter could be shown to be lethal to developing mosquito larvae, and, therefore, act as a natural ecological trap for Cx. Pipiens…. (Beyond Pesticides, December 14, 2018) The richness, diversity, and abundance of wild bumblebees in Vermont has plummeted over the last century, according to an analysis from researchers at the University of Vermont and Vermont Center for Ecostudies (VCE). This research adds fresh evidence to the growing realization that mankind is witnessing and contributing to, as the New York Times recently labeled, a worldwide insect apocalypse. “We’re losing bumblebees even before we fully understand their benefits to our economy and well-being, or how they fit into ecosystems,” said Kent McFarland, study coauthor and conservation biologist at VCE in a press release. Researchers conducted surveys with the help of 53 trained citizen scientists. Alongside the researchers, these individuals surveyed bumblebee populations through a combination of photos of wild bees and net collections. In total, over 81% of the state’s municipalities were included in the survey, representing all of Vermont pollinator’s biophysical regions…. Read more at Beyond Pesticides. Our big fundraiser took place on Saturday December 1, 2018, at 5-8 p.m. at the Unitarian Congregation, 501 S. High St., West Chester. Thanks are due to many: Chef Sylvie, La Baguette Magique, Kim Stack, and Two Gander Farm for the vegetarian fare, Tom Buglio for the piano accompaniment, live auctioneer Lori Zytkowicz from Briggs Auctions, moderator Sa’ed Atshan, the hard-working planning committee, those who set up and then cleaned up the venue, and all those who donated or purchased auction items and enjoyed a great evening supporting us. For more background see here. Monsanto’s new herbicide was supposed to save U.S. farmers from financial ruin. Instead, it upended the agriculture industry, pitting neighbor against neighbor in a struggle for survival. Mike Wallace sat in his pickup truck on a dusty back road near his farm outside Leachville, Arkansas, typing impatiently into his cell phone. “I’m waiting on you,” he wrote. “You coming?” It was hot for late October. The rows of soybeans, cotton, and corn, which just days ago had spread across much of the region, were largely gone, replaced by dry, flat dirt. The 2016 harvesting season was nearly over. A minute passed, and Wallace typed another message, sounding slightly triumphant. “Looks like you don’t have much to say now. Wallace, 55, was a prominent figure in the Arkansas Delta farming community. His 5,000-acre farm was large, although the yield on that year’s soybean crop hadn’t been as successful as he had expected. Wallace believed he knew why his crops had failed, and it had nothing to do with the sun or the rain or the decisions he had made about when to put his seeds in the ground. Instead, he blamed a 26-year-old farmhand named Curtis Jones for illegally spraying dicamba, a controversial weed killer, on a neighboring farm. Wallace believed the dicamba had drifted onto his fields and damaged almost half of his soybean crop, costing him hundreds of thousands of dollars. By Michele Berardi, Daily Local News, Sept 3, 2018. Looking forward to cuting down on chemical herbicides in the next growing season! KENNETT SQUARE — It’s not every day you see a heard of goats at a retirement community, however every day residents and staff at Kendal~Crosslands Communities in Kennett Square, care for the environment. “We have a section of our 500-acre campus that can easily be overrun with invasive or otherwise problematic species of plants”, says Casey Groff, staff horticulturist and grounds manager. “Instead of resorting to herbicides, machine rental or exhausting manual removal, goats will eat and thrive on many of these weeds. This can be a win/win situation,” says Groff. Goats are a beneficial land clearing tool. The versatility of goats as a sustainable agricultural asset has been well documented for centuries. 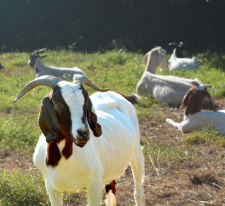 Using goats in the role of eco-friendly, all-natural, land-clearing machines is a fairly new concept that is catching on across the nation as an option to herbicides…. The program, moderated by Paula Kline of Ready for 100, also featured the presentation of an award for volunteer of the year on behalf of Don’t Spray Me! by Sierra Club of SE PA leader Wylie. Rachel Davis, who won this honor as a result of her leadership on environmental issues in the community, headed the program Adopt a Drain with the Sierra Club Youth Corps, monitoring storm drains throughout West Chester Borough. Rachel is a member of Mayor Herrin’s committee to phase out the use of single-use plastic in the borough. She was also a block captain and board member for Don’t Spray Me! and serves the Borough on the Sustainability Advisory Committee. Congratulations, Rachel. This film, the final this year in a series of four, was sponsored by Don’t Spray Me!, Sierra Club, PennFuture, PennEnvironment and West Chester University’s Office of Sustainability. This second annual series was presented to the community in memory of Graham Hudgings, who died last year as a result of chemical poisoning. Graham wanted everyone to be aware of the dangers of pesticides, herbicides, fungicides and all of the everyday chemicals people now encounter in their daily lives. For background info on the film, see here. As a Conservation Committee of Sierra Club’s Southeastern PA Group, Don’t Spray Me! helps implement, in Chester County, Sierra Club’s goal of cutting back human practices harmful to nature and human health. DSM focuses on pesticide spraying and the use of other harmful chemicals. DSM also supports Sierra Club’s Ready for 100% Renewable Energy campaign, which works against pollution from fossil fuel extraction, transportation, and consumption. See https://www.sierraclub.org/pennsylvania/southeastern/. DSM is a founding member of the West Chester Green Team, whose mission is to promote green living in the West Chester Area. See https://wcgreenteam.wordpress.com/. DSM is also a founding member of the Chester County Environment Alliance, which, with about 25 member groups, aims to enhance the environment and environmental consciousness in Chester County. See https://chescoenvt.org/. We post items that we think are generally reliable and of interest to our readers without necessarily endorsing all statements and recommendations by other authors and organizations. The threats posed by mosquitoes are evolving, and many methods of controlling and repelling mosquitoes are in use or under discussion. We welcome readers' comments and experiences, either here or on Facebook.